When I started climbing as a young teen in the 1990s, I went through a phase of wearing slimmed-down parachute pants. Those pants were great, if goofy, for unhindered movement: the fabric billowed at the waist and tapered to a close fit at the ankle (the pair I wore did not have the extreme bagginess that sagged past the knees). They were pretty good for moving around on the rocks, I thought. Plus they were less revealing than the leopard-print Lycra tights that some other climbers wore back then. Now there is a plethora of technical wear designed for climbing: shorts and pants with articulated seams that provide a stylish cut without restricting movement, and some even wick moisture away from the body and are wind- and water-resistant. One of the newer and worthy additions to this family is the Foehn Brise Pant. Foehn is a small company based in Quebec, Canada, whose clothing hit the market this last January with help from a Kickstarter campaign. The Brise Pant has been their flagship item and they have already sold out of at least two iterations at the time of this writing. More will be in stock this October, and with some key changes, which I'll discuss in a bit. I recently interviewed Ingrid Sirois, who cofounded the company with her life partner Anthony Boronowski. Those two have an interesting backstory that pertains to the founding of Foehn, and I'll get into that later as well. For now, back to the Brise Pant: I have yet to try the redesigned version, so this report is based on the pants I've been using, but I will point out where Foehn is making revisions. 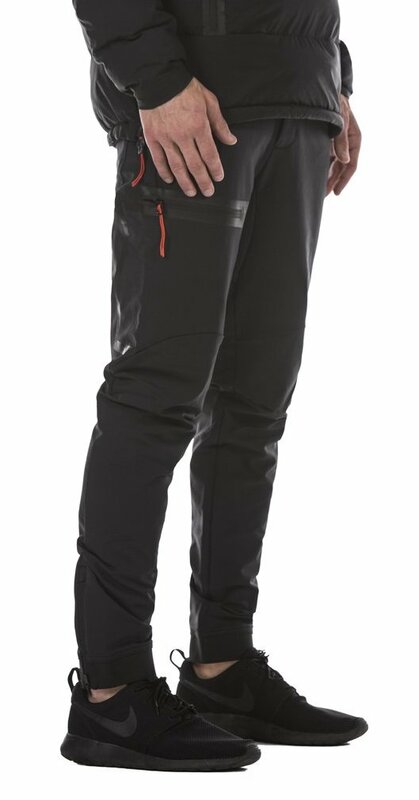 Foehn's website describes the Brise as "a performance rock climbing pant [that] combines style and function by merging technical performance with a modern point of view. Designed to wear and function equally well in all environments." The original model that I have is made with a double-weave fabric that is 90 percent nylon and 10 percent Spandex. The double-weave makes the pants quite warm. They are great for cooler temperatures or windy or damp conditions, but I avoid wearing them if it's going to be much warmer than 65 degrees Fahrenheit. Sirois told me that some people have even been using them for ice climbing. 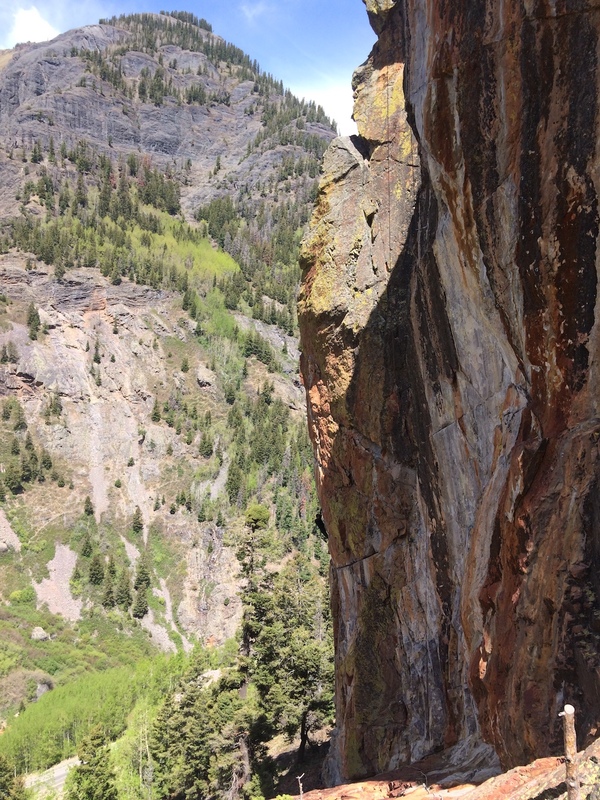 She and Boronowski really had more of a rock-climbing purpose in mind, so they are changing the fabric to a twill-woven material that is 96 percent nylon, 4 percent Spandex. This will make the fabric lighter and less of a shell pant, though it will be treated with a durable water repellent (DWR). Less Spandex means the fabric won't elongate quite as much, though it will still have a four-way stretch. One of my small criticisms of the old version is that the fabric is crinkly and loud, having the classic zip-zop sound that snowpants make when you walk in them. The new fabric won't have this problem, according to Sirois. The other criticism I have also appears to have been addressed in the redesign—the shallow hip pockets. Sirois told me they are adding a couple inches of depth to these, which will be a great change, because my current pair doesn't come close to holding my wallet or phone comfortably, and I have to remove those items from the pockets before I can sit down. It sounds like the new version of the Brise Pant will be OK in this regard. More on pockets.... 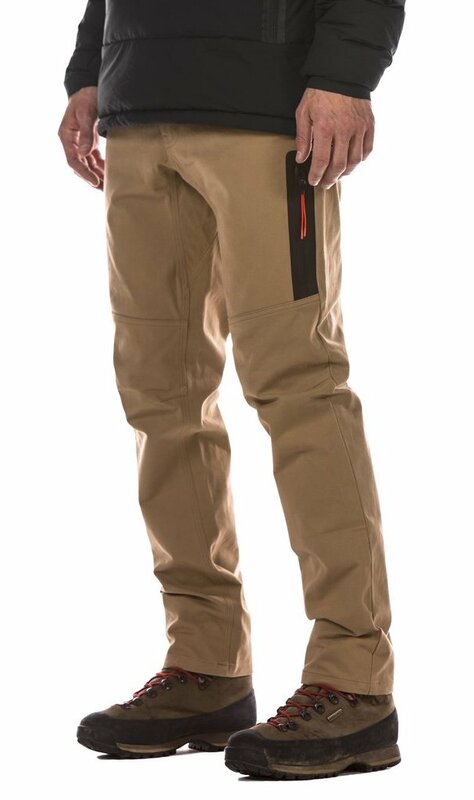 The pants are definitely made to be worn with a harness, as evidenced by a large, top-loading cargo pocket with a waterproof zipper on the right thigh. The cargo pocket holds my large iPhone 6s with room to spare, which means that on the wall it could hold a hat, gloves, a snack, etc. There is also a smaller, inner pouch and a loop for clipping items that I wouldn't want to lose, such as a set of keys. Meanwhile, the location of this large cargo pocket is something new to me. I'm used to having my cargo pockets on the outside of the leg, but this one is positioned on the front, or top of the thigh. The result is a mixed bag for me. It's nice having an object like my phone balanced flat on top of the leg, as opposed to being on the side of the leg where it can flop behind the knee, but when it comes to climbing I prefer not to have anything on top of my knee in case I want to kneebar behind a flake or in a crack. But then again, I generally prefer not to have things in my pockets during a climb anyway. When I wear these for climbing and don't need to carry anything in my pockets, the Brise Pant is great. The stretchy nylon fabric has a relaxed fit up high but it hugs the legs and tapers all the way to the ankles, giving the pants a precise fit without restricting movement. And the zippered ankle cuffs are nice to have for sealing in warmth or to just keep the material from getting in the way of my feet while dancing across a delicate slab. I've enjoyed my pair of Brise pants and I would say they are comparable to a pair of Prana softshell pants I have. Foehn also markets a down jacket, flannel shirt and another pair of pants dubbed the Nelson Pant. As a side note, I've tried the Nelson Pant ($149.95), which wears like a cross between the Brise Pant and a classic pair of Carhartt jeans, as it's made with a thicker material that gives the pants a protective quality; I wear the Nelson Pant to chop wood and tend campfires. Unfortunately the Nelson Pant has a thick seam that goes all the way across the top of the knee, and when I walk the seam slides up and down each thigh to the point that it starts to chafe my skin within a half-mile of vigorous hiking. Maybe my skin is just too soft and sensitive, but I can't recommend this particular design until the issue with the seam is addressed. Sirois was eager to receive this feedback and said they will consider how to remedy the problem. I hope they do, because I would love the Nelson Pant if it weren't for that chafing seam. It was the Nelson Pant, actually, that marks the early beginnings of Foehn's story. Sirois' previous life partner was JP Auclair, a world-renowned extreme skier from Canada who died in an avalanche in Chile in 2014. Boronowski was also a talented skier and a close friend to Auclair. Before Auclair's death, Boronowski's ski career was coming to an end, and he had to find something else to do. He started designing clothes. He went on to make clothing for Lululemon, Armada, Smartwool and Black Crows, among others. "JP kept bugging Anthony to make some climbing pants," Sirois said. "Finally, as a gift, Anthony made him a pair that was basically the Nelson Pant." In the aftermath of Auclair's death, Sirois and Boronowski stayed close and ended up becoming romantic partners as well as business partners. They are now fully invested in Foehn, and have shied away from taking on outside investors even though it's made it more challenging to fund the company, which is slowly growing. Foehn's clothing line is currently limited to men's styles but the company is working on a women's clothing line as well that will launch in October with plans to be ready for market next spring. Alpinist Digital Editor Derek Franz has been climbing for most of his life but he's been wearing pants for even longer.